Today we are going to learn most popular Single Page Application called as Angular Js using Angular CLI ( Command Line Interface ). We know by using Angular we can build modern applications such as web, mobile, or desktop in the real world. Previously we learnt about another famous single page application called as Aurelia. 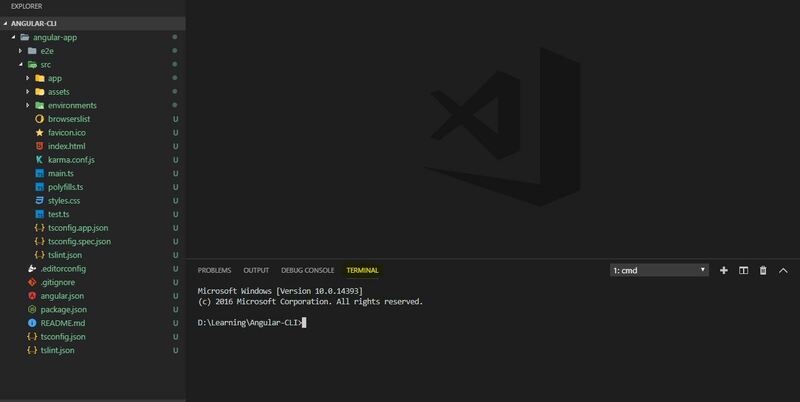 Download and Install : VS Code ( A best opensource editor for developing Angular Application,etc ). Download and Install : Git ( Not mandatory but use for a best practice ). We can install Angular Command Line Interface after the installation of “node js” in our environment. This will help you to create projects, generate application and library code, and perform such variety of ongoing development tasks such as testing, bundling, and deployment in our application. So this will reduce the time of development activities because of command line Interface register and generate files automatically at the beginning stage. So that is why we need a version control for newly changed item in the application and it will identify in which files what types of changes are reflected. This is more helpful for the beginners in Angular CLI application development. Now we can install the Angular CLI globally by using the following command in our application. Now we are going to create a simple project repository in our environment. The repository I have created in Github account and it is been cloned in my environment(machine). The best practice of Angular CLI or any other application is configuring a version control in our VS Code otherwise we blindly create and check-in the code in project repository. No issues we can continue without configuring a version control in our application. Go to our repository or the place where we are planning to create a project setup , open the command prompt and run the following command. Angular CLI created “angular-app” in our repository. Click on Visual Studio Code Extension menu in left side bar then search “Angular Essential” (john papa) in the search box. Once we install Angular Essential, it will install all other supporting packages in the application automatically. 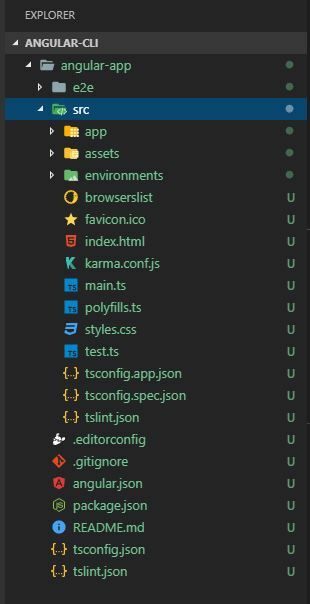 Also It will generate a different icons for all the folders,ts files,style,json,etc. We are generated a dummy application in our repository. The next step will be to build our application. For that open a “Command Terminal” in Visual Studio Code. Click on Visual Studio “Terminal” menu from the top of the menu list. “Terminal” menu displays a list of options , just click “New Terminal ( Cntrl + Shift + ~ )”. There is one more short key for opening “Terminal” in VS Code ( “Cntrl + ~ ” ) . We can see the following terminal displayed on the right side bottom of VS Code. Now we need to build our application for that we need to open root directory of the application. May be when you open the Terminal in the VS code it will display the repository path of our application. So just change to application path by the following way. The build artifacts will be stored in the dist/ directory folder in the application. Now run the Angular CLI build Command. If you are getting the following error then that means we need to install “@angular-devkit/build-angular” dev dependency. This package is newly introduced in Angular 6.0. The following command will help us to create devkit dependency in our application. If you are facing this same issue after the installation of dev kit then you need to uninstall and install the angular cli. Components are the basic UI building block of an Angular app. So here we can see there is a “app” component generated under the “src -> app” folder in “angular-app” application. If you are using Angular CLI then it will auto generate all the files that are relevant for your basic application. For example in the following screen shot app folder contain such auto generated files are css,spec,ts and module. Now build is succeeded, Yes our application is ready to serve. Please run any of the following command ( one is alias or a short command ) to open our application in a browser. or If we don’t want to open application in a browser then just run the following command and navigate to "http://localhost:4200/". So we can bundle our application using any of the following command and flag “–prod” bundle for production. Every application should navigate to "http://localhost:4200/" as default. So If you are really thinking to open an application in a different port address then it is possible. Just run any of the following command. As I mentioned earlier the default port we have changed to “3000” instead of “4200”. 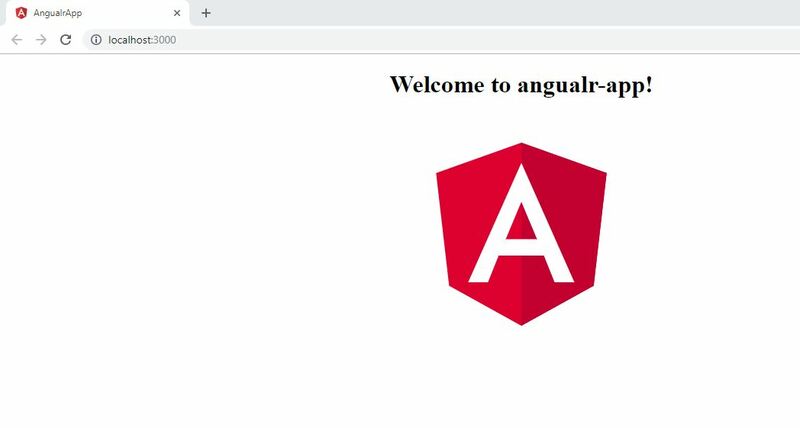 From this article we have learned the basic configuration of Angular 6 using Angular CLI and few basic CLI commands. I hope this article is useful for all the Angular CLI beginners.